We are longtime supporters of SWAIA and Indian Market and are looking forward to creating a beautiful magazine for the 95th Santa Fe Indian Market, said Bruce Adams, publisher of the Santa Fean. Santa Fe Indian Market is pleased to announce that the Santa Fean Magazine will publish the beloved Indian Market Magazine. “We are longtime supporters of SWAIA and Indian Market and are looking forward to creating a beautiful magazine for the 95th Santa Fe Indian Market,” said Bruce Adams, publisher of the Santa Fean. The Santa Fe New Mexican will once again produce this year’s Santa Fe Indian Market booth guide. In addition, SWAIA has published the official 2016 schedule of events for Santa Fe Indian Market and Indian Market Week. For a full list of events, please visit,SWAIA's website. Begins Tuesday August 16 through Sunday August 21. No-charge and open to the public. Seating is first-come, first-served. 8:00 p.m. - 11:00 p.m. The Kick Off Party features a preview of IM: Edge at the Convention Center. DJs, VJs, light installations, urban art battles, muralists, and performing arts, and dancing officially launch Santa Fe Indian Market 2016. No-charge and open to the public. Sneak Preview: 5:30 p.m. - 7:30 p.m. & General Preview: 7:30 p.m. - 9:30 p.m. SWAIA members get an early look at the winners during the Sneak Preview hours, while the public’s first chance to see the winning artwork takes place immediately after. 9:00 a.m. - 4:00 p.m. The Plaza stage and Cathedral Park is the setting for a number of exciting events and programs. Music and performing artists fill the stages for visitors to augment their Indian Market experience. 9:00 a.m. - 12:00 p.m. Among the many cherished traditions at the Santa Fe Indian Market, the Native American Clothing Contest is one of the most beloved and anticipated events. The contest includes categories for traditional and contemporary Native fashions— featuring children and adult participants with award prizes in a variety of categories. 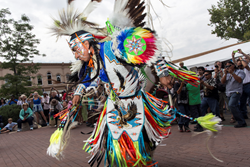 The 95th annual Santa Fe Indian Market takes place downtown Santa Fe on August 20 and 21, 2016.